It may be early in the school year, but we’re moving right into the craft of writing. While we will shift into some narrative, creative writing next week, these first two weeks have had a focus on the start of “response to literature” writing pieces. 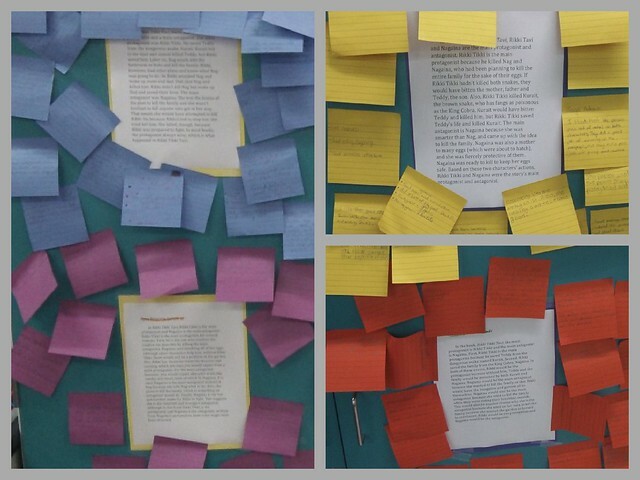 This is a big focus of sixth grade — responding to reading, using evidence from the text, adding insights to understanding. Yesterday, I shared four “not-really-random” student samples of some open responses that they wrote a few days ago (after listening to Rikki Tikki Tavi, they wrote about protagonist and antagonist), and we went through an activity in which students read the sample responses, identified strengths in the pieces before them, put observations on sticky notes, and then stuck the notes up on the wall where the student exemplars were located. I like the visual here (who doesn’t love sticky notes? ), and I like making the notes about the positive public to the students. But most of all, I loved the conversations we had about “noticing” and “reflecting” on the pieces, particularly as they made connections to their own writing. This reflective stance and being able to see the strategies of others is the first step in a year-long push for reflective practice. Reflection will move into revision, if all goes according to plan. But you can’t revise if you don’t see what needs revising, right?